I dabble in the yoga. I'm not the best in the class, definitely far from it, but I'm not completely embarrassed to do it in front of others. We have some GREAT yoga instructors at our local YMCA here. 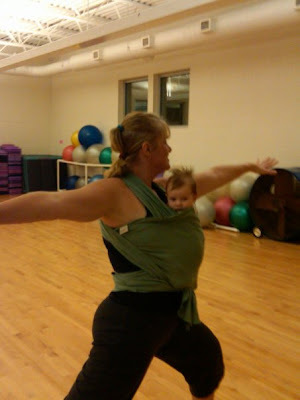 I was able to do it throughout the entire pregnancy because of great teachers like Jennifer. Now, since Sarah has been doing yoga since before she was born she has become quite the yoga master. Look at her judging Jennifer to make sure she has perfect form in her Warrior 2 pose! Thanks Jennifer for wearing Sarah for me so I could come to class the other night!